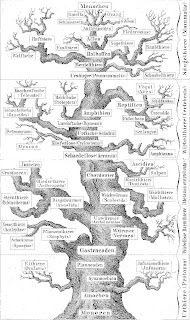 The Genealogical World of Phylogenetic Networks: Evolutionary trees: old wine in new bottles? Evolutionary trees: old wine in new bottles? Biblical scripture tells us about the dangers of putting new wine into old bottles (Matthew 9:17, Mark 2:22, Luke 5:37). Here, I will say a few words about the equal folly of putting old wine into new bottles. A number of authors have considered the iconography used to display biological (and other) relationships, and noted that it both reflects the way biologists think and it influences their ongoing thought processes (Brace 1981; Stevens 1984; O'Hara 1992; Stevens 1994; Clark 2001; Ragan 2009; Gontier 2011; Tassy 2011). In particular, several of these authors have noted that the Darwinian revolution did not much change the way that many biologists thought about biological relationships although it did to some extent change the way they presented them. That is, they practiced the art of putting old wine (their old way of thinking, based on a linear series of relationships) into new bottles (an evolutionary tree, allegedly based on genealogical history). The following series of icons illustrates this historical process. 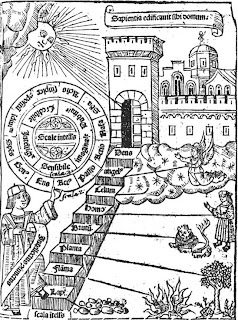 We started with the image of a series of steps ascending from "lower" forms to "higher" ones, an idea apparently originating with Aristoteles, with ourselves near the top (eg. 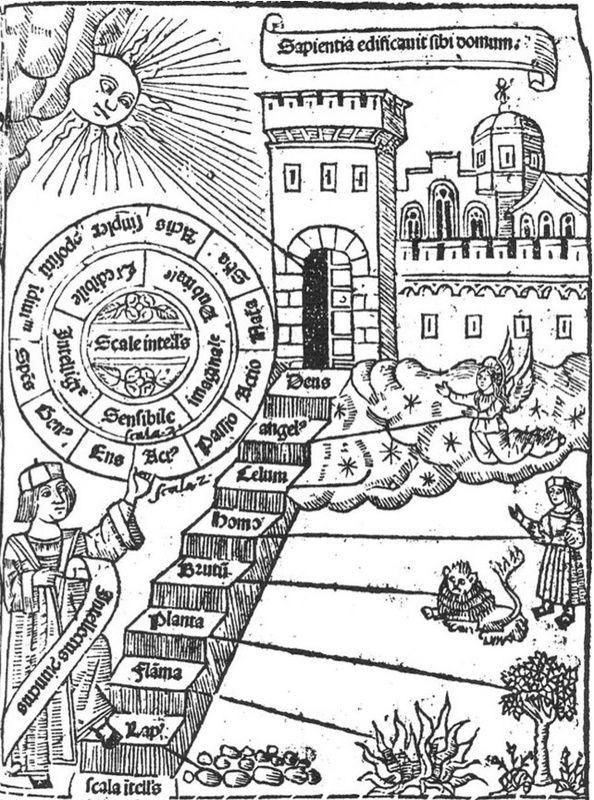 Llull 1304, which illustrates the Ladder of the Intellect). Note that Homo is between the plant & animal steps and the sky, angel & god steps. We then converted this to the formal Scala Naturae, or Great Chain of Being (e.g. Bonnet 1745), which eliminates the non-living forms and non-earthly beings and thus restricts itself to observed biological phenomena. Note that Homo is at the top of the chain. Lamarck (1809) challenged this simple linear series, using instead a branching diagram to represent transformations among biological forms, with each form transforming into another form through time. However, Lamarck's version of evolution was still essentially a transformation series among organisms, and thus his diagram was simply a slightly branched version of the Scala Naturae. Darwin (1859) then challenged the very idea of transformation series, insisting upon both the origin of new biological forms and the extinction of some of the old forms. He used a bush as his icon, but we have always referred to it as a tree. Indeed, it is worth noting that Darwin never explicitly refers to any of his diagrams as a "tree" (see previous blog post), referring instead to "descent with modification". The diagrams were intended to represent his ideas on continuity of descent through time, and the role of speciation in increasing biodiversity and extinction in counter-balancing this (see Kutschera 2011). Their primary purpose was not the representation of phylogenetic history. Darwin's "Tree of Life" metaphor is thus quite independent of his diagrams, both published and unpublished (see Penny 2011). However, it is the one paragraph of the Origin containing this poetic imagery that seems to have been inspired people. 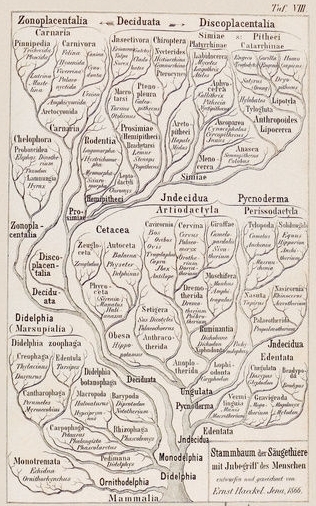 Indeed, Wallace (1855), the co-discoverer of "Darwinian evolution", had already used a very similar image, when he noted: "the analogy of a branching tree [is] the best mode of representing the natural arrangement of species ... a complicated branching of the lines of affinity, as intricate as the twigs of a gnarled oak ... we have only fragments of this vast system, the stem and main branches being represented by extinct species of which we have no knowledge, while a vast mass of limbs and boughs and minute twigs and scattered leaves is what we have to place in order, and determine the true position each originally occupied with regard to the others". This theoretical icon was taken up by empirical scientists such as Mivart (1865) and Haeckel (1866), who then used a bush as the icon for their presentation of explicit hypotheses of genealogical relationship. Note that Homo is on a side-branch. Note that Homo is at the top of the central trunk. From Smallwood et al. (1948). This approach can be used to put any chosen organism at the crown of the tree, not just human beings, as illustrated by Scott (1986). This is the fundamental difference from a chain — a chain is linked so that there are only two possible ends, but a tree can be drawn so that any part of the tree is at the crown. This sequence of icons shows you that, indeed, one can (metaphorically) put old wine in new bottles — the Scala Naturae can be put into an evolutionary tree. This thinking can be detected throughout modern evolutionary publications (Nee 2005). Unfortunately, it re-inforces the view that evolution is a purposeful and goal-directed process, which runs counter to current scientific understanding. In this sense, we have lost much of what Darwin tried to tell us back in 1859: that the history of life is a multi-stemmed bush not a single-stemmed tree. "We do not know why it should be so, but we have learned from working with thousands of students that, without contrary training, people tend to have a one-dimensional and progressive view of evolution. We tend to tell evolution as a story with a beginning, a middle, and an end. Against that backdrop, phylogenetic trees are challenging; they are not linear but branching and fractal, with one beginning and many equally valid ends. Tree thinking is, in short, counterintuitive." That is, the problem illustrated above is still widespread. (i) presenting a sequence of contemporary taxa so that a main axis passes through the diagram (as I have illustrated above); (ii) the left–right ordering of the taxa at the tips (which is mistakenly interpreted as representing an evolutionary series); (iii) the selective pruning of side branches (thus making one line of evolution more prominent); (iv) the use of paraphyletic groups; and (v) the differential resolution of branches. In particular, in a bush the relationships among monophyletic groups (clades) are equal, in the sense that each clade is the sister to some other clade and vice versa. 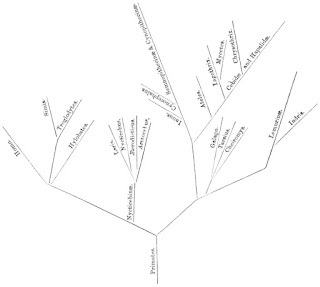 Thus, clades cannot be "basal" or "crown", because each single clade branches from some other single clade, rather than each clade being a side-branch from a main stem. Logically, at each speciation event two new species arise, rather than one species producing an extra offshoot species. There is no main stem in an evolutionary tree, but instead there is a series of branches leading to a series of twigs, even if some of the branches do have more twigs than others. My interest in raising these issues here is in considering whether these apparently widespread problems are likely to affect the use of reticulating phylogenetic networks as much as they do dichotomous phylogenetic trees. Since I recognize two forms of phylogenetic network being used in practice, there are two situations to evaluate when considering an answer to this question. If the icons used for displaying biological relationships are non-genealogical "webs, nets, maps, or other basically horizontal, planar, reticulating structures" (Stevens 1984), as discussed in a previous blog post, then there seems to be little likelihood of linear distortions being produced. This is a simple by-product of the unrooted nature of the diagrams and the consequent lack of direction in the relationships (ie. the relationships between taxa are symmetrical). Any rooted, and thus explicitly directional, diagram can be subjected to linear distortions by the simple expedient of emphasizing some directions at the expense of others. In this sense, rooted reticulating networks and non-reticulating trees are prone to the same potential problems. It might be argued that reticulations make it harder to emphaszie a single direction, particularly if there are many reticulations, but this seems to be a weak argument. We will thus need to guard ourselves against the implicit Scala Naturae when employing evolutionary networks (e.g. hybridization networks, HGT networks, recombination networks; see previous blog post) just as much as when employing evolutionary trees. * Footnote: In Haeckel's defence, I should quote from Richards (2011): "Haeckel regarded these two types of diagrams as having different purposes. The first represented ... a proper stem-tree, one highly branched. The latter diagram simply looked back from a given organism — in this case man — to its lineal progenitors. It's as if one began with the first kind of tree and traced back the series of man's direct ancestors— and this would result in that second kind of tree. Haeckel had not precipitously regressed, within the space of a few years, into a dogmatic teleologist." Baum D.A., Smith S.D. 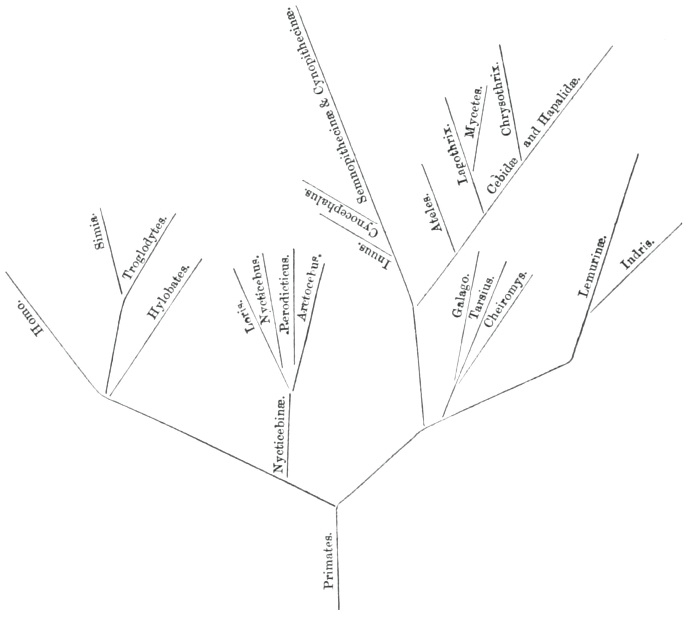 (2012) Tree Thinking: An Introduction to Phylogenetic Biology. Roberts & Company Publishers, Greenwood Village, CO.
Baum D.A., Smith S.D., Donovan S.S. (2005) The tree-thinking challenge. Science 310: 979-980. Brace C.L. 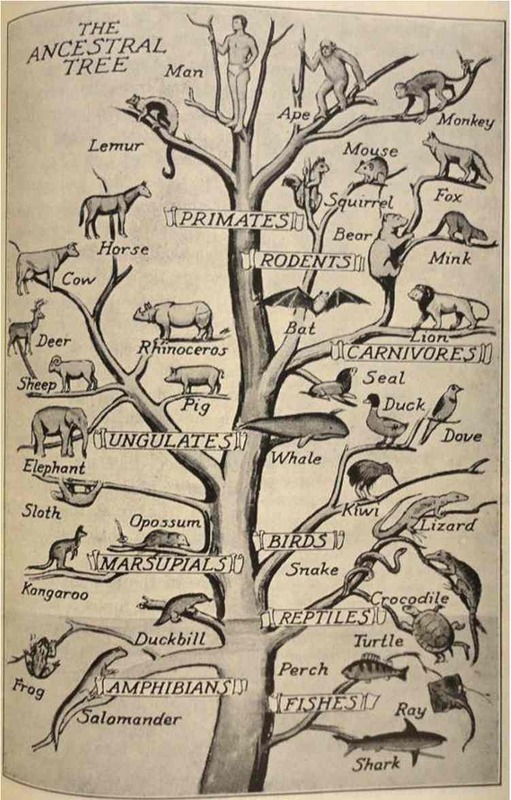 (1981) Tales of the phylogenetic woods: the evolution and significance of evolutionary trees. American Journal of Physical Anthropology 56: 411-429. Clark CA. (2001) Evolution for John Doe: pictures, the public, and the Scopes trial debate. Journal of American History 87: 1275-1303. Crisp MD., Cook LG. (2005) Do early branching lineages signify ancestral traits? Trends in Ecology and Evolution 20: 122-128. Gontier N. (2011) Depicting the Tree of Life: the philosophical and historical roots of evolutionary tree diagrams. Evolution: Education and Outreach 4: 515-538. Gregory TR. (2008) Understanding evolutionary trees. Evolution: Education and Outreach 1: 121-137. Krell F-T., Cranston PS. (2004) Which side of a tree is more basal? Systematic Entomology 29: 279-281. Kutschera U. 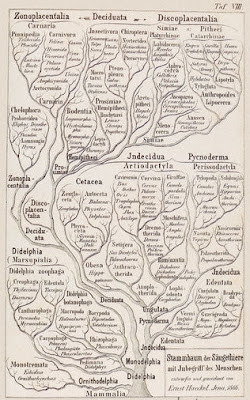 (2011) From the scala naturae to the symbiogenetic and dynamic tree of life. Biology Direct 6: 33. MacDonald T., Wiley EO. 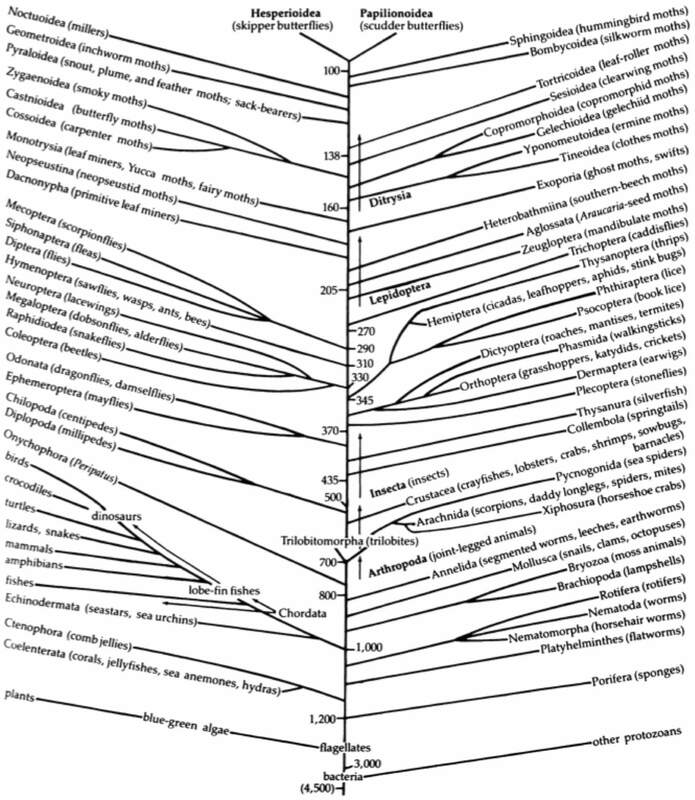 (2012) Communicating phylogeny: evolutionary tree diagrams in museums. Evolution: Education and Outreach 5: 14-28. Nee S. (2005) The great chain of being. Nature 435: 429. O'Hara R.J. (1992) Telling the tree: narrative representation and the study of evolutionary history. Biology and Philosophy 7: 135-160. O'Hara RJ. (1997) Population thinking and tree thinking in systematics. Zoologica Scripta 26: 323-329. Omland K.E., Cook L.G., Crisp M.D. 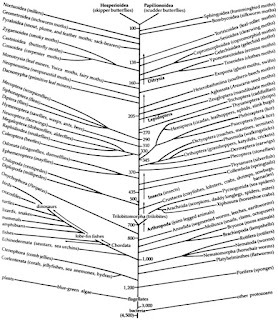 (2008) Tree thinking for all biology: the problem with reading phylogenies as ladders of progress. BioEssays 30: 854-867. Penny D. (2011) Darwin’s theory of descent with modification, versus the biblical Tree of Life. PLoS Biology 9: e1001096. Ragan M. (2009) Trees and networks before and after Darwin. Biology Direct 4: 43. Richards R.J. (2011) Images of evolution. American Scientist 99: 165-167. Sandvik H. (2009) Anthropocentrisms in cladograms. Biology and Philosophy 24: 425-440. Stevens P.F. (1984) Metaphors and typology in the development of botanical systematics 1690-1960, or the art of putting new wine in old bottles. Taxon 33: 169-211. Stevens P.F. (1994) The Development of Biological Systematics: Antoine-Laurent de Jussieu, Nature, and the Natural System. Columbia Uni. Press, New York. Tassy P. (2011) Trees before and after Darwin. Journal of Zoological Systematics and Evolutionary Research 49: 89-101. Wallace AR. (1855) On the law which has regulated the introduction of new species. Annals and Magazine of Natural History (n.s.) 16: 184-196. Bonnet C. (1745) Traité d'Insectologie, premier parte. Durand, Paris. Darwin C. (1859) On the Origin of Species. John Murray, London. Haeckel E. (1866) Generelle Morphologie der Organismen. Reimer, Berlin. 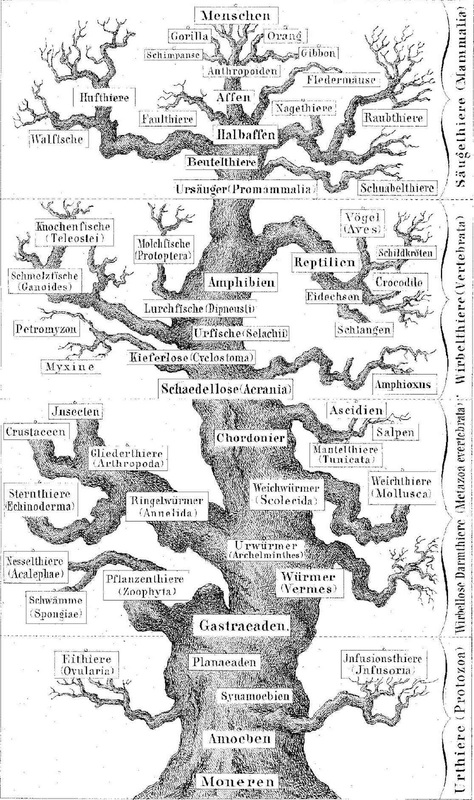 Haeckel E. (1874) Anthropogenie oder Entwickelungsgeschichte des Menschen. Engelmann, Leipzig. Lamarck J-B. (1809) Philosophie Zoologique. Dentu et l'Auteur, Paris. Llull R. (1304, published 1512) Liber de Ascensu et Descensu Intellectus. Jorge Costilla, Valencia. Mivart St G. (1865) Contributions towards a more complete knowledge of the axial sleketon in the Primates. Proceedings of the Zoological Society of London 33: 545-592. Scott J.A. (1986) The Butterflies of North America: a Natural History and Field Guide. Stanford Uni. Press, Stanford. Smallwood WM., Reveley IL., Bailey G.A., Dodge RA. (1948) Elements of Biology. Allyn & Bacon, Boston.